On this day in Tudor history, 1st April 1536, the imperial ambassador passed on information he’d received from two separate sources to his master, Emperor Charles V. The news was regarding Henry VIII and his behaviour towards one of his wife’s ladies-in-waiting, a certain Jane Seymour. Find out exactly what happened, what Henry and Jane were up to, and how long this had been going on, in today’s “on this day” video, which you will find below. « Did Anne Boleyn have much to do with Elizabeth? Ooh, don’t you just wish we had this letter from Henry to Jane Seymour and not just the eye witnesses and third party reports on what happened when she received it? Wouldn’t it be marvellous, if someone found it, still sealed, the DNA from Jane Seymour pressed upon it, from her lips, then being the first to carefully lift the seal and open it, this heart stopping moment, you are the first eyes in hundreds of years, the first gloved fingers to carefully handle this precious document, the first to even read it, as Jane didn’t read it, only the King of England, Henry Viii has seen this precious love note, only he knows the secret of her heart and the secret words of his own heart and desires, expressed on the pages in your hand, on a cushion before you, this is a living history moment, you are about to discover what Henry asked or offered Jane Seymour on that late March day 1536 and the butterflies are bubbling in your stomach. What a moment that would be! Just think we would find out more about how Henry saw Jane at this point, his feelings and his desire for her. We don’t have the tumbling outpouring of passion that we have in his Courtship of Anne Boleyn, we don’t have the passionate, highly sexual love letters as he wrote to Anne, supercharged with emotion and often frustration and distress or tenderness, so we can all too easily be dismissive of his love for Jane and his intentions. One thing we do know was this was how Anne had fired his ardour. Jane was careful to do the same thing, maybe she was coached, but personally I doubt she was coached about this, she had served Katherine of Aragon and Anne Boleyn, watching under those hooded eye lids of hers which are rather alluring, watching and learning and she did as Anne had done, but, Jane guessed and her supporters probably encouraged her in this, that Henry was bound to react favourably and offer her marriage. Just how he achieved a new marriage was up to him, but I don’t believe for one moment that Jane was complicit in what happened next and the way Anne’s downfall was arranged, sorry came about by her enemies and conspiracy. It would for me be a really marvellous thing to read this letter and put Jane’s response into a clearer context. We can make an educated guess that Henry was offering to serve her as his mistress and her family had reminded her that Anne had been offered the same thing but her refusal had led to a more permanent offer of the crown. Jane, I believe saw what she could do as Queen, or hope to do as Queen, restore order in the Royal family by helping to reconcile Princess Mary to her father. Of course she had a number of people coaching and helping her, but I don’t believe there is enough evidence to say she was a Seymour or Conservative party pawn with no will of her own. I believe Jane was just as clever as Henry’s other wives, maybe she didn’t have book intelligence, but clever common sense, she was shrewd and maybe a bit ruthless, but caring and loving as well as a traditional Tudor woman. She had learned from two formidable Queens and she had a formidable faction around her, but she was capable of making her own decisions and she was capable of handling Henry well. Henry was attracted to Jane by something, it would be great to know the qualities he saw in her, perhaps he expressed them in this lost love letter. Yes, it may well have been a command to the Royal bed, but it may also have been a true expression of love and desires. We simply don’t know. The letter is lost, a mystery; just think how breathtakingly historical the discovery of this would be. Hopefully, one day. I am interested if there is any surviving gossip from people actually working at the court such as Henry’s men or other employees. I would love to know what was being said by them rather than just ‘outsiders’ such as Eustace Chapuy. I’m guessing the king’s behavior regarding spouses was a new experience for everybody. 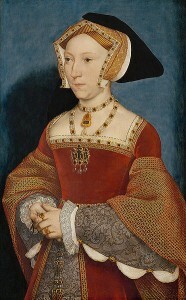 Jane Seymour had a number of very important supporters, including Thomas Cromwell, the Pole and Montague families, the King’s intimate friends such as Nicholas Carew, in fact anyone who supported Princess Mary and we can see Jane is the focal point, if not the figurehead of this collective and even Jane Boleyn showed support for Mary. She and many women protested in her favour and showed support for her on one of her moves from one house to the other. We know that she was put in the Tower to cool her heals and she wasn’t the only one as much later in July Henry had everyone baying about Mary rounded up, questioned and confined. Mary, herself, ensured their survival with her submission to her father’s wishes. Before this, however, Jane tried twice at least to get Henry to be reconciled with Mary, went further in fact, she asked for Mary to be restored to the succession. This request is often played down by historians, but I believe it was brave and very significant. Not that it was likely but, had Henry agreed, history may have been easier for Mary. Jane would have been celebrated, not called a failure because Henry rebuffed her. Jane shrewdly said that she spoke only for the peace and tranquillity of the King and the people and for the peace of the kingdom as well as their children. Henry was pleased and Jane afterwards was known as a peace maker but he insisted on Mary making a full submission to his wishes first. Jane tried again but this time Henry warned her to keep out of his business and to remember what happened to her predecessor, who did intervene. Mary was visited by a delegation who made threats and she was persuaded by both Thomas Cromwell and Chapuys to sign the article of submitting to Henry, accept that her parents were not lawfully married and that she was illegitimate. Jane had been in contact with Mary and did arrange for them to meet and thus father and daughter met for the first time in almost five years and Mary was welcomed back to Court. Jane was coached in many ways how to speak to Henry about how unpopular his second marriage was, but it was her decision to try to help Mary because Jane had supported Katherine of Aragon before any of this began. Jane was a champion of the cause of the Princess and of those who followed the traditional Catholic Faith. Support for Mary as the heir to the throne crossed the religious divisions at Court and so Jane was backed by members of many old factions and evidence points to her waiting in the background from before the tragic loss of Anne’s unborn baby boy in January 1536, although the nature of her relationship with Henry is not known. By March, however, Henry was looking at Jane at least as a mistress, if not a potential future wife. Her response to the letter he sent her reported by Eustace Chapuys here in this letter on April 1st appeared to have made up his mind. Jane had presented herself as full of virtue, a good woman, of good parents, of good estate and who would only be a wife and he admired her for this humility and virtuous speech. From now on, Henry would court Jane with only her parents present and he would do so in private, in her new apartments, those given up by Thomas Cromwell, adjoining the King’s and linked by a private corridor and her reputation would be protected. Henry was still married to Anne and there was no obvious sign that was about to change, but here we may see the first sign that it was a possibility Henry now began to treat Jane with the dignity and honour due to his future wife and Queen and mother of his lawful heirs. I have always considered Jane Seymour to be the least attractive of all Henry V111’s wives, with her rather large head on her slim shoulders she looks somewhat top heavy, her large nose tightly pursed mouth and piggy like eyes, I can see nothing in her portrait that shows us the charm that Henry V111 saw, I think after Anne had lost his baby boy he seriously contemplated taking another wife, he was not looking for a pretty face, he was getting on in years now and I think pretty desperate, Anne had failed him she had promised him sons and not delivered, moreover she had made many enemies at court and her outbursts of temper irritated him, and because he was fed up with her, quite possibly the rest of her family irked him to, the Seymours however were rising high in his favour, he must have noticed this quiet little woman the way she moved around at court, doing his wife’s bidding and she was demure and shy, which was in stark contrast to his witty overbearing wife, people are always attracted to change, sometime he visited her father’s house and found Jane there, her father Sir John Seymour was of the country gentry and his wife was one of the court beauties of her day, it would be interesting to see a picture of her but we have none, we know however that she did not pass her beauty onto her daughter, they had sons and Henry must have thought here was a girl pleasant and respectful towards him, from a fertile family what if she could give him sons? So I think it was these things in Janes favour that made him really consider making her his next queen, we all know the oft told tale about how Jane in true virtuous maidenly fashion sank to her knees and refused to accept the Kings gift of money, what we do not know is what was going through her mind at this time, was she merely going through a charade to ensnare Henry or did she actually mean what she said, was she really trying to preserve her honour? Hilary Mantel says she was teasing Henry and I can see her brothers hand in this, they no doubt advised her what to say and do but Jane had a brain herself and could well have worked out her response to the King, did she really think Henry would consider marrying her, certainly during their courtship he must have confided in her how unhappy he was with his queen, it was noted that for several weeks he had not spoken one word to her, as Chapyus reported, I think Jane wanted to be queen but not for herself, I think she wanted to help people and bring back the true religion to England, as her actions later concerning the rehabilitation of the Lady Mary into Henrys good favour and she also despaired over the loss of the monasteries, here we see a charming side to Jane which is not how the fans of Anne Boleyn see her, to them she is the woman who callously stood by when his wife went to the scaffold and let those bloodstained hands slip his ring on her finger, but Jane could not stop Annes execution, she cannot be blamed for something which Cromwell and I believe the King concocted, she was merely the woman whom the King wished to replace his wife with, Jane did not wish for wealth and power, but merely the wish to use some of that power to help others, which came with being queen consort, I cannot see her saying deragotory things about the queen as I doubt if she would have dared, as I commented in a previous post, I think she merely listened and sympathised when the King spoke of his troubles, I doubt if Jane ever liked Anne who was her second cousin through their maternal grandmother, she probably thought she had little in common with her, Anne surrounded her self with all the witty talented people of the court, Jane was not one of them and she could have found her caustic comments a little overbearing, and of course Jane had loved Katherine her former mistress, and must have wept for Mary whose misery was well known, so she may have thought as many did that when Henry began to tire of Anne it was the best thing that could happen, she saw a chance to do good and I admire her for that, although by her becoming Queen Anne had to go, she cannot be blamed for Henrys method of ridding himself of Anne, and Janes death was awful having endured a very difficult labour, her passing must have been very very sad for the court and Henry did mourn her genuinely, though I doubt if she had ever stirred real passion in him the way Anne or Bessie Blount ever had, Bessie he was said to have been quite in love with for several years and Anne was an obsession, his feelings for Jane seemed more of a deep affection which arose out of respect, but as he grew older and he went through two more disastrous marriages he began to look back on his Jane with rose tinted spectacles, she became to him the perfect wife was she not the only one out of all his queens who had given him a living prince, she would be honoured with a magnificent tomb in which they would both lie together for eternity, there hasn’t been many books written about Jane Seymour and it’s possibly because to us, like her contemporaries she appears rather dull and insipid, she was no warrior queen like Katherine of Aragon, or a dangerous seductive like Anne Boleyn, she was not intelligent like Catherine Parr or a pretty little engaging minx like Catherine Howard, she does not appear interesting enough to write about, I believe that’s more do with with her sudden death as had she lived longer, she could have achieved so much more, her looks too have taken a beating her complexion was described as being so white she looks pale, a dazzling white complexion was sought after but clearly with a healthy bloom, and Jane must have looked rather wan, ‘no one thinks she has much beauty’ remarks Chapyus, but clearly she did have something for the King to notice her, she left a court deep in mourning at her death, and meanwhile her two brothers were in the Kings household and their prominence rose with the ascension of Janes son Edward V1, it is interesting to note that Henry did not think of marrying for several years after her death, and then only with the coercion of Cromwell. Yes Jane did try to get Mary back in line to the succession which was incredibly brave of her, as Henry was very sensitive about this issue, he told her to think more about advancing the children they would have and then she pleaded with the restoration of the monasteries, Henry thought here we go again another nagging self opinionated wife, on one occasion he did tell her to remember what happened to her predecessor, what a charming thing to say and shows he must have been very angry with Jane, Jane herself must have been quite frightened, but to her credit she did achieve what she wanted to and Mary became reconciled to her father, his brutish attempts to make her succumb to her will however have made Henry V111 look rather like an ogre, but we have to consider from his point of view that Mary had defied him long enough, and no other monarch would suffer such behaviour from a son or daughter, so he sent Norfolk and others to visit Mary and bully her into signing away her mothers right to be queen, it was something which haunted her to the end of her days, their behaviour sounds awful but Henry had insisted they do not return without the document, and therefore their actions can be explained, they probably felt very sorry for this poor girl who stood before them, short and slight but Mary was not easily frightened and stood her ground, however in the end she had no choice, they must have threatened her with the word treason, and heartbreakingly she gave in, Jane it seems did not have much to do with Elizabeth but she was still a toddler, and at Christmas they were all together so Jane quite possibly could have requested that, her death from childbirth was very tragic as I think she would have been a very good queen consort to Henry V111, and for England to for many years. Mary was more important to Jane, I think because, as the daughter of Katherine of Aragon and Henry Viii and as a daughter of the Catholic Church, she, not Elizabeth was legitimate and the true heir, his eldest daughter and Elizabeth was both illegitimate and the daughter of the Queen who had usurped Katherine as the true Queen. However, as a toddler of less than three, it was hardly surprising that Jane paid her little heed. Mary was Henry’s first born daughter, the only surviving child of Henry and Katherine and one thing which may have been advertised to Jane was that Anne Boleyn had played a role in the mistreatment of Mary and she probably saw herself as having a role to reverse that. Certainly Mary herself made the mistake that Anne was fully behind her exile and wrote to Henry and Jane, assuming Henry would bring her back to Court now that Anne was dead. In this Mary underestimated her father and miscalculated his own authority behind Anne’s actions. It was to Thomas Cromwell that Mary reached out asking for her father’s blessing and for reconciliation but Henry would brook no more disobedience from his daughter and her defiance denied his royal title as Supreme Head of the Church. The enforcement of this was about to reach its final stage and to refuse the oath was now treason. It is highly speculative, but there is evidence which is suggestive that Henry intended to insist on Mary being told to take the oath. At the time there were rumours and fears, expressed to Mary herself by Chapuys that Henry may put her to death if she doesn’t sign and Chapuys was genuinely anxious about her safety. I don’t believe there was any concrete evidence that Henry wanted to execute or even considered executing his daughter, but the fear was real and when Henry responded to his daughter’s letter by sending the above delegation, they made it very clear that Mary must submit to Henry by acknowledging that her own parents were not lawfully married, that she was therefore not born in lawful wedlock and they threatened her. We are told that the Duke of Norfolk said that if she was his daughter he would beat her until her head was soft. Personally I don’t believe this, even if it was reported later. Some kind of threat was made but none of them would have dared to touch her. The idea was to frighten her into seeing sense. It worked, Mary, in a state of shock and suddenly realization that her father had changed and he meant business. With the help of Cromwell and Chapuys she signed the Articles and Henry received her letter of submission. After these Articles were signed Jane arranged for a meeting with Mary and Henry a one of her houses and the three spent time together and Henry gave her money and was very affectionate towards her. A few weeks later Mary was received back at Court formerly and she was treated with dignity and honour by both Jane and Henry. Mary and her father had a good relationship for the rest of his life and she was particularly close to Anne of Cleves and Katherine Parr, who served in her household before her marriage to the King. I don’t think Jane particularly ignored Elizabeth, but she was in her own household until Christmas 1536, when the family were indeed together, which probably was at Jane’s request as much as Henry reaching out. Jane would have realised that whatever the state of her own parents marriage and the truth behind the terrible accusations that led to Anne’s downfall and execution, it was hardly the fault of a three year old little girl. I suspect that while she took little active interest, that she made some enquires and responded to requests for new clothes. However, there wasn’t much Jane could do proactively because Henry wasn’t interested in making life better for his previous daughters, he only wanted Jane to concentrate on getting pregnant, which by the end of January 1537 she had succeeded doing. Then he ordered quails by the dozen which she craved. Jane continued to do her duty and at the end of the day was successful and luckily gave birth to a son, Prince Edward after 72_hours in labour. We also know that Jane took risks when it was important, despite her submission normally, with the intercession for the Northern Rebels and begged to restore the religious houses. A negotiation to save particular ones took place in her apartments, for goodness sake; Henry was far from pleased. Anne, it appears was more of a proactive Queen than Henry was comfortable with, that is why he chose Jane, she appeared to be no trouble. Unfortunately, with the support she had, the coaching she had and the convictions of her own, Jane wasn’t quite the little woman that she is often thought to be. She was familiar with the education of a gentlewoman, was as educated as any traditional Tudor woman, she had fantastic skills at needlework and some lovely pieces survive, she was an expert horse woman and huntress, was good at music and dance and she was able to speak French, Latin and Greek well. I really don’t understand why people continue to claim she was dull or uneducated or a doormat. There simply isn’t the evidence to substantiate such claims. Henry saw her as the opposite of Anne, but in reality they have more in common than we think. The two women both served Katherine of Aragon, they both used the same ploy to catch and keep the interest of a King and they both responded to his needs and what he looked for in a Queen. By playing on his own fears and insecurities both Anne and Jane used their own strengths to convince him that they had what Henry needed to make him happy and give him sons. Anne gained his intellectual interest and Jane provided tea and sympathy when Henry felt his wife didn’t understand him. Henry began to believe his marriage to Anne might not have been a good idea after all and Jane was there to reassure him that was the case, that his marriage wasn’t popular. Jane appeared gentle and kind and she Henry wanted peace and quiet. However, Jane herself had to be very careful at first and work hard to win people over as not everyone was happy when Henry married her so soon. Her warmth towards Princess Mary was also a way to win the affection of the people as Mary was very popular. Yes, it was her own campaign but it was a smart way to win popular support and she hoped Henry would also see this as a way back to his people’s hearts, but Henry loved the power of the Supremacy and the wealth from the monasteries enriched his treasury. Jane was content to be in the background and she did bring him an oasis of peace on the whole in the middle of the most tumultuous period of his reign. I find her portrait attractive and Anne Boleyn was no beauty, but Jane was more shrewd as well and maybe there is just something just out of reach, under those hooded eye lids. Yes where her father was concerned, Mary was very naive she thought after Annes death it would not be long before she received a request from Henry to come to court, the wicked witch was dead all would be as it was before, she wrote him several letters and could not understand why she was being ignored, she then pleaded with Cromwell, the result was a delegation who came knocking on her door, a group of soured face men, not the friendly summons she had expected from her beloved father, she had only been young when her father decided to split from her mother and like most children, blamed the other woman, or the other man, Mary still loved her father and it was easy to believe it was Anne the wicked stepmother who was the cause of her misery, she did not realise that by openly defying her father for years, she had hardened his resolve to brow beat her into submission, the death of Anne meant nothing, she Mary was still illegitimate the only difference was her sister Elizabeth shared her debased status, and now she must sign the oath, Chapyus fearful for her advised her to sign, to refuse was treason and the penalty was death, but I do not believe for one minute that Henry V111, brute though he was, would ever have sent his own child to the block, he had always been inordinately proud of her and just before Annes death, he had sent for Mary and Fitzroy and embraced them both, and said how grateful he was they had escaped the cursed whore who would have done them both to death, we do not know if he was play acting here, as his later jovial behaviour regarding Annes arrest and trial does not fit with the actions of a wounded betrayed husband, Mary did enjoy happy days with her new stepmother and father and these were the most happiest she had ever known for a long time, they must have been a tranquil family, Henry was pleased with Jane and he was about to become a father again, it is nice to think of Mary with Jane walking amongst the gardens at Hampton Court arm in arm, sitting embroidering together, dining together and chatting amiably, after years of misery she was at last content even though she was still not back in the succession, she was chief mourner at Janes funeral and she must have wept as the coffin was lowered into her grave, here was a woman who had shown her true kindness, i think Jane held a special place in Marys affection, and she was very close to Edward possibly out of love for the mother as well as being her blood kin. You put that very beautifully, Christine, yes, I can picture that brief time as being happy and the great relief, but maybe sadness too, although she did continue to have a very good relationship with Henry. I think she also gained some support from Katherine Parr who was another good mother, that time to all of Henry’s children. Have you read The King’s Pearl: Henry Viii and His Daughter Mary by Melita Thomas? It is an intimate portrait of Mary and her father and is very moving and you do see how their relationship was so upside down, but she had a very close relationship with him, especially when she returned to Court. Her letters show the agony of this time and her fears and how much people at Court kept her in the loop. It’s a beautiful and very illuminating duel biography. It only covers the time until just after Henry Viii died but I think you can understand Mary through those turbulent years and through the settled times with Jane and Katherine Parr and her love for her mother comes through as well. Beautiful picture you give us, Christine, lovely, many thanks. I’ve tried to like Jane Seymour; by thinking of what it was like to be her in Tudor England, but I don’t. I think she was the most disingenuous and calculating of Henry’s queens. She was coached & she deliberately provoked Queen Anne. I believe she had a slanderous tongue when she spoke with King Henry. She probably in her mousy way – said some things that were true – true enough to make Henry rethink Anne. For ex: the people hate her. I believe it was karmic justice that saw Queen Jane, Henry Fitzroy & Thomas Cromwell to death. These were people that hated and betrayed her. King Henry’s punishment was to live and to live in pain. Jane was coached to a certain extent, yes, but we don’t know exactly what she said to Henry, but we can speculate that she was encouraged to raise the issue that people found Anne’s marriage uncomfortable and opposed it and that was actually true. The legislation Henry had passed making talking against his marriage a capital crime shows he was aware of that fact. Anne was a decent Queen and tried to do her best with her charity, which, yes, was part of her role as Queen, but she took a personal interest in and increased. Letters exist which show that Anne was helping people and she did win over some support. The biggest sticking point was Mary. Jane, genuinely, without any evidence of coaching wanted to help Mary. Anne was blamed for her mistreatment but we know it continues in Henry after her execution. There is something shrewd, not cruel, but with a ruthless streak hidden under the hooded eye lids in her portrait. However, I don’t believe there is any evidence that people hated her. At first there was shock at the swiftness of her marriage to Henry, but that was at Henry, not Jane who was a sixteenth century woman with limited choices and while she wasn’t forced to marry Henry, was hard pressed to say no. To believe she had total freedom in this is to misunderstand the sixteenth century. Anne was as calculating as Jane, if Jane was calculating, we don’t really know what her inner motivation or feelings were and Anne was just as ambitious and both men had an affair with a married man. They are actually not much different and both ladies put a high price on their virtue. Anne refused Henry’s letters and advances and to some extent his marriage to his true Queen, Katherine was over, physically anyway when he looked at Anne as his future wife. When he offered her the crown because he was in love with her, he believed he was not lawfully married and he needed a male heir. Anne accepted the crown and promised him sons, a bit rash, but there you go. They were passionately in love and Henry clearly hoped for sons. The latter didn’t materialise and Henry became inpatient because he was getting on and the same sad pattern of loss he had experienced with Katherine was happening with Anne. I believe he sought an annulment at first but changed his mind and Anne became the victim of a slur campaign and conspiracy to remove her permanently, love turned to hate, Jane and the faction who backed her, presented herself as an alternative and Henry believed he would find happiness and sons. I too don’t believe Jane was as demure as she presented, but that was very clever and she played on his greatest weakness, his love for his only living child. However, if anyone is to blame for what happened next, it was Henry, not the women, even if they were calculating and manipulating. Henry = Boss=Supremo= All bow down and obey. What evidence do you have that people hated her? As I said, they criticised her hasty marriage and she worked to win hearts and minds but she soon did and the people adored her, especially when Mary came back, even though Henry insisted the poor girl submitted to his wishes first. The people held prayers and holy possessions when she was in labour and hopes fell on her bringing back the true faith. What evidence do you have that Cromwell hated Jane Seymour? Sorry, that is Hollywood. Do you mean he turned on Anne Boleyn and met his fate? Firstly, I find that sort of remark about karma highly inappropriate and completely horrifying. Jane may or may not have hated Anne, we don’t know what her feelings were but so what, Anne Boleyn hated Katherine and said she would rather see her hung than acknowledge her as her mistress! Did Anne get what she deserved because she was cruel to Katherine and Mary, which again was mostly Henry? No, of course not, because it’s nonsense. Who else is on this Ayra type comeuppance list? O.K. Henry Fitzroy. I don’t really get what you are talking about, but Henry Fitzroy died in July 1536 and had been ill for some time, so his death had nothing to do with Anne or Jane and there is no evidence that he hated Anne Boleyn. His father had a conversation with him the night before she died telling him he was lucky to be alive as Anne had intended to kill him, but that was a sorrowful and manipulating King and father. The evidence is actually to the contrary. Anne had arranged his marriage to her relative, Mary Howard, sister to the Earl of Surrey and we know very little else about their involvement. Cromwell was the person who was involved in the fall of Anne Boleyn, a although it is far more complex than that, but Henry gave him the order and the permission to find a way to get rid of Anne. Cromwell did a stitch up yes, he was the master plan behind her fall, but Henry gave the order. Yes, Thomas Cromwell fell and he too was executed because he had a number of enemies, just as Anne did. His death had nothing to do with Anne Boleyn and no, it wasn’t karma and although he would not be my top person, he didn’t deserve the botched execution he received. As for Henry, he had a lot to answer for, many sins to atone for in the afterlife and I am not his judge. As someone who by the way does suffer constant pain I find your remarks highly offensive. I find the idea that disabled people suffer because of some invention of karmic justice repugnant and this is a misinterpretation of the meaning of karma anyway. Henry was in pain due to his love for a dangerous sport, jousting and he had several accidents. Now you may believe he deserved everything, that is your opinion and a lot of people probably agree, but I don’t believe anyone deserves this that and the other because something else happened to so and so. Henry Viii had to stand before the Great Judge and we don’t know if he repented or not. He also faced the greatest judgement, that of history and it is right to be highly critical of him for his acts of tyranny as well as to give him credit for the years before he was like that. I don’t agree, however, that his life of pain is some kind of warped cosmic justice and nor was the fact that poor Jane died after child birth payback for the fall and unjust execution of Anne Boleyn. I am not asking you to like her, but please try to form an opinion based on information, accuracy and research, not a misinterpretation of karma. Thank you BQ for answering so beautifully that comment that left me speechless when I read it yesterday. Thanks, Michael, it is something that people put on social media all too often, much to Claire’s annoyance. Not liking people is one thing, that’s an opinion we are all entitled to, but saying people deserved some kind of horrible or tragic death or to lose loved ones because of poor decisions, which are actually due to someone else astounded me. I really didn’t know what to say, but hopefully some perspective helps. Thanks for your kind words.